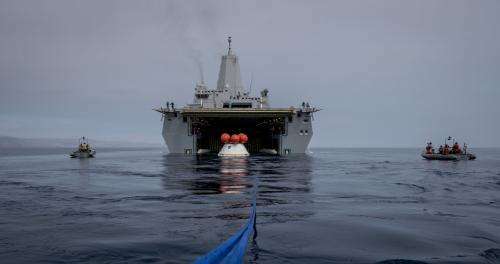 A test version of NASA's Orion spacecraft floats inside the well deck of the U.S.S. Anchorage on Aug. 2, 2014, during recovery tests off the coast of California. A combined NASA and U.S. Navy team practiced recovery techniques over the weekend, in preparation for Orion's first trip to (and return from) space in Exploration Flight Test-1 (EFT-1) in December. After traveling 3,600 miles into space on the uncrewed EFT-1, Orion will return to Earth at a speed of 20,000 miles per hour and endure temperatures near 4,000 degrees Fahrenheit before landing in the Pacific Ocean.